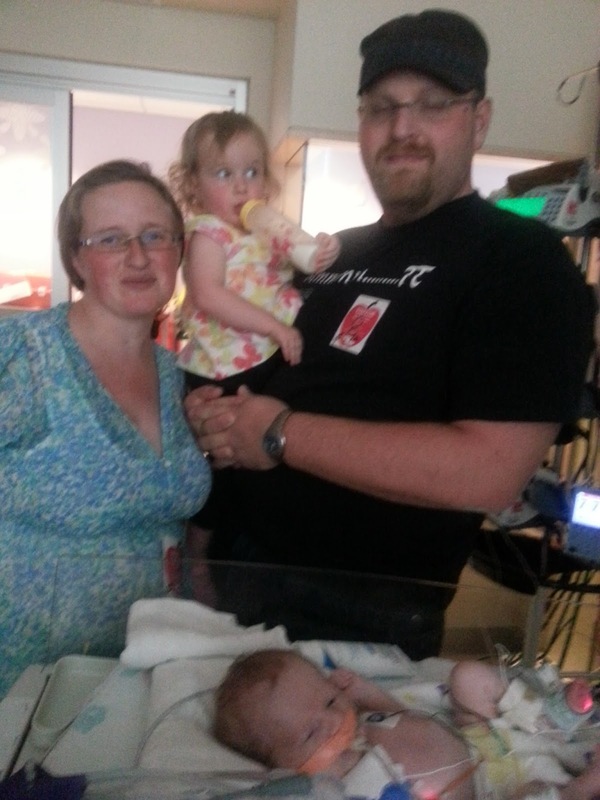 Willow visited the hospital on Saturday for the first time since Clarity was born. It was a short visit but she liked seeing the baby, although she was frustrated that she couldn't kiss or touch her. We also got visits from my mom, my brother's family and Q's cousin's family. It was fun showing off our girl. On Saturday, Clarity was continuing to wean on the ventilator settings and dopamine and epinephrine amounts. In late morning, they had to do the weekly dressing changing over her lines and she was extremely unhappy about it. It took the rest of the day for her vitals to return more to where we want them. Overnight, she continued to seem agitated (grimacing, sucking her tube, wiggling her hands and legs) and she ended up getting several extra doses of Versed and fentanyl, along with a little Atavan. By the time rounds happened this morning, the biggest question for the nurse was what we were going to do to continue trying to calm her down. She got another bolus of Versed/fentanyl at 8:15a and then, somehow, she managed to finally get calmed down to the point that she didn't need any additional meds beyond her usual drips. When we came back from lunch, her vitals were good. She was awake, opening her eyes and looking around a little. She moved a little but not with the restlessness she had exhibited earlier and then she closed her eyes and went back to sleep - without any medical assistance. Since we wanted to spend the afternoon at home with Willow, that was a very reassuring way to leave her for the day. Her blood pressure is hanging out just above where they really want her but the dopamine and epinephrine are for keeping her blood pressure higher so it should be going down as we continue to wean her on those. The dopamine was at 4 this afternoon. I still can't believe that it was at 12 just a few days ago. Today, she also had a blood transfusion due to a low hematocrit count. Apparently, with as frequently as they have to take little blood samples, it's pretty common problem for these little ones. We assume she's also going to need more transfusions due to the surgery, so it's nice to get through the first one in a low stress situation. Clarity is scheduled for another echocardiogram on Monday morning and doctors are saying that if it looks like they expect it to, they're planning on scheduling her repair surgery for either Tuesday or Wednesday. Crossing our fingers that she'll just keep doing so well! 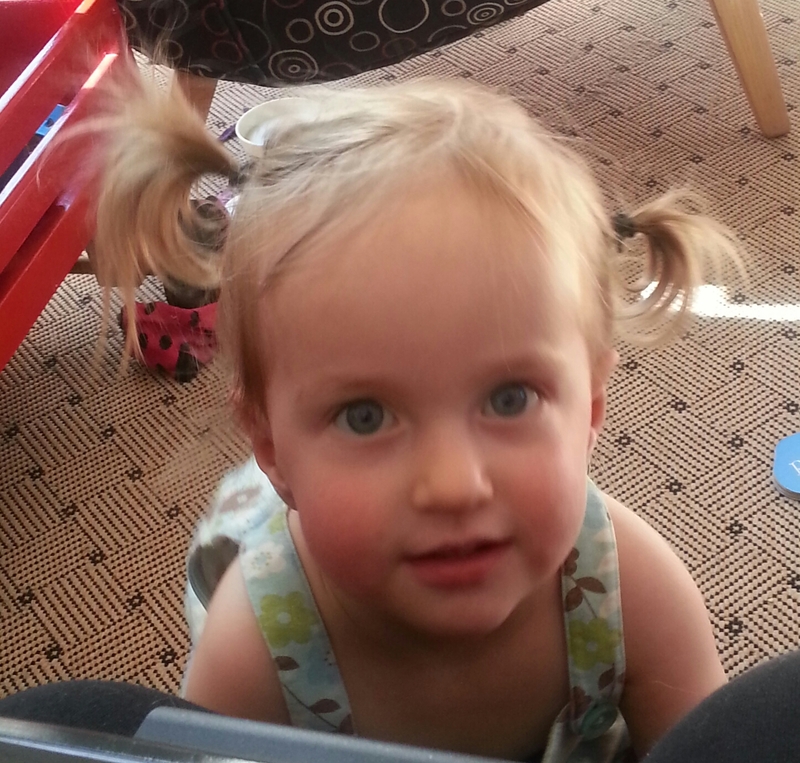 Grandma has managed to start catching Willow for ponytails.